There’s nothing wrong with pampering yourself, especially when you’re on vacation. After all, vacations are all about taking time away from the everyday, so why not treat yourself to a first-class inn, hotel, resort or outfitter where every detail is considered? Here are 13 four-star establishments in the maritime regions of Québec that are really worth the detour. All of them offer gourmet cuisine, relaxation and boundless comfort. 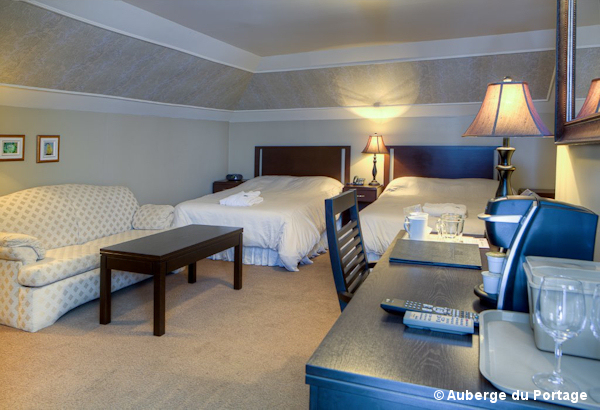 Bas-Saint-Laurent is known for its charm and Auberge du Portage is no exception. Elegance and comfort await you in this superb Victorian-style establishment that includes a cosy health spa, stunning views of the magnificent St. Lawrence and an organic garden. Not surprisingly, the inn’s dining room serves delicious regional cuisine. This heritage building built in 1903 has the additional benefit of being located in Notre-Dame-du-Portage, one of the most beautiful villages of Québec and well worth an extended visit. A few miles away, the imposing Hôtel Universel is located in Rivière-du-Loup. With nearly 200 comfortable rooms (ranging from Classic to Excellence), this modern establishment offers its guests a wide range of amenities. You can relax at UniverSpa Nordik and enjoy dining at the hotel’s two restaurants, which have different menus and ambiances. Le Rialto offers refined Italian food in a contemporary decor, while La Verrière offers family dining with an international twist. 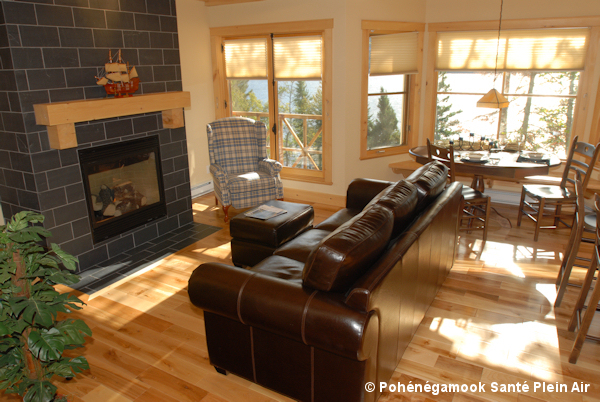 If you’re a nature lover, a stay at Pohénégamook Santé Plein Air is a must! This four-season resort centre has many lodging options, ranging from cottages to rooms in two inn pavilions to luxury country homes. Nestled on the banks of majestic Lake Pohénégamook, the resort emphasizes well-being in its offerings. For example, you can experience deep relaxation by alternating between hot and cold treatments in the Nordic baths. Body care and massage therapy are also available. 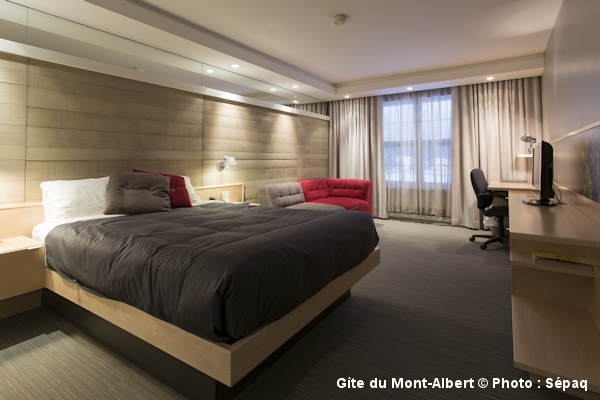 Regional winner of a Québec Tourism Award in 2013, Hôtel Rimouski is another heavyweight in the region, with 185 rooms including 52 luxury suites. Its health centre will help you restore fitness and tone, while its restaurant, La Seigneurie, will delight you with its varied and inventive menus. If you enjoy the outdoors or just want to have fun, the hotel also offers several interesting packages. For example, you can explore the Canyon des Portes de l’Enfer (Hell’s Gate Canyon), wander through the Reford Gardens or learn about life as a submariner aboard the Onondaga at the Pointe-au-Père Maritime Historic Site. 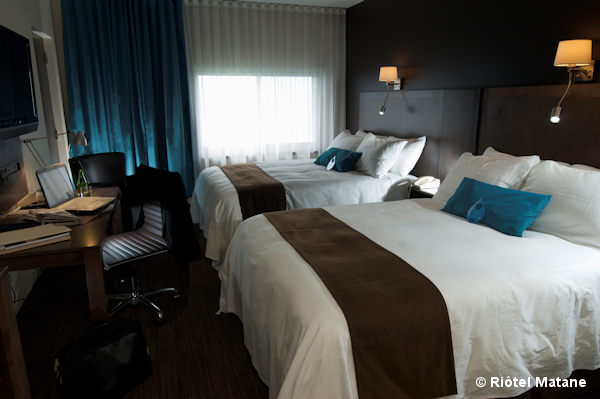 A stay at Riôtel Matane is an immersion in a maritime environment. Located right on the beach, this 4-star hotel offers luxurious accommodations in an enchanting setting. 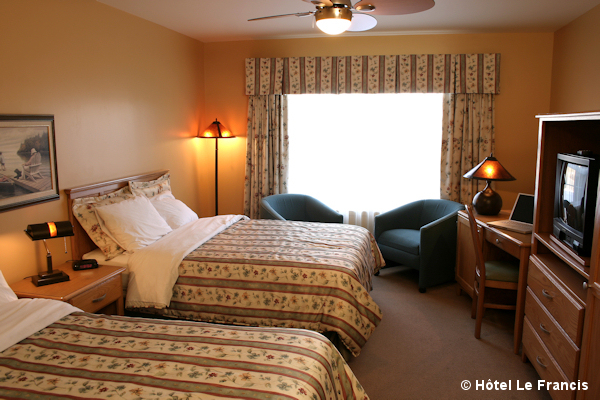 The whole building has been renovated with the needs of guests in mind, from the warm wood flooring, comfortable carpeting and soft lighting to the air conditioning and quiet electrical heating. The hotel’s atmosphere is enhanced by its helpful and professional staff. You can admire superb scenery while enjoying an exquisite meal at the Le Grand Bleu restaurant or while soaking in the outdoor spa or going for a swim in the supervised outdoor heated pool. In other words, this hotel is sure to please! Forest lovers will be in their element at the Auberge de montagne des Chic-Chocs, a backcountry retreat deep in the mountains of the Gaspé Peninsula. Nestled at the heart of the Réserve faunique de Matane, the Lodge is a haven of serenity, with only 18 rooms for guests. The friendly and helpful lodge staff and guides will make you feel right at home in this pristine natural setting. Another establishment surrounded by mountains is the Auberge du Gîte du Mont-Albert, which is located in awe-inspiring Parc national de la Gaspésie. After a fun day of hiking or a long drive, you can enjoy relaxing by a crackling fire in this renowned establishment. A warm decor, fine regional cuisine and gracious hospitality await you in this imposing hotel built in 1950. Treat yourself to a stay in one of the hotel’s 60 rooms or enjoy the intimate cosiness of any of the 23 picturesque cabins located nearby. 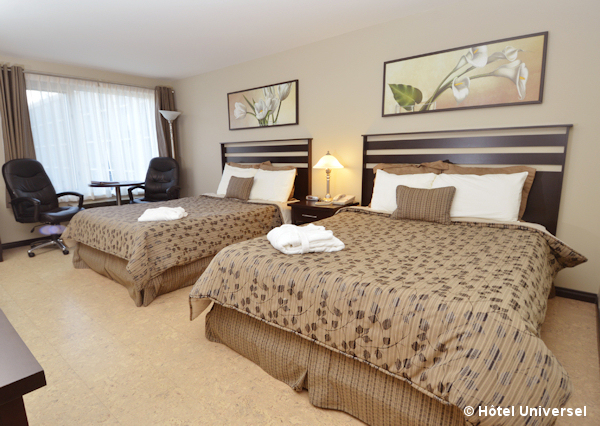 As is mentioned on its website, Hôtel Le Francis in New Richmond is an exceptional vacation destination that lets you make the most of your visit to the Chaleur Bay region—a claim it lives up to! Combining comfort and elegance, the hotel offers a range of room options (from standard rooms to suites) as well as two restaurants with a relaxed urban atmosphere. In addition, you can enjoy the outdoor spa and pool and rent kayaks or bikes to explore the surrounding area. The north shore of the St. Lawrence has its own share of jewels, one of which is Hôtel Tadoussac, a landmark heritage building. Since it opened in 1865, this resort hotel has entranced guests with its old-fashioned elegance and modern comfort. 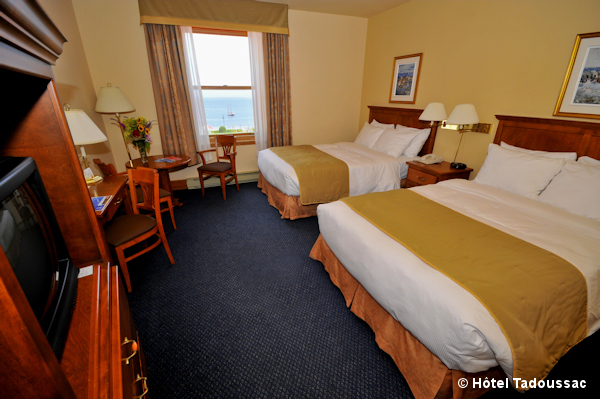 The hotel’s natural surroundings add to the magic of your stay: you won’t tire of admiring beautiful Tadoussac Bay. Come and visit a landscape painted by nature! The magic of the past also awaits you in Baie-Comeau. Although built more recently (in 1937) and renovated in 2004, Hôtel Le Manoir has maintained its historical charm while becoming even more comfortable and technologically advanced. The hotel is located in a quiet area, at the heart of the city’s historic quarter and near the beach. Most rooms offer a stunning view of the sea and you can take advantage of the hotel’s patio on summer nights to bask in the fading light of the setting sun. You’ll need to take a boat to get to Pourvoirie du Lac Geneviève, on Anticosti Island. This outfitter offers several lodging options to guests who want to soak up the charms of this island paradise, which is home to a large population of white-tailed deer. Five lakeside cabins and two former lightkeeper’s houses on the north point of the island offer all the amenities required for a relaxing getaway. 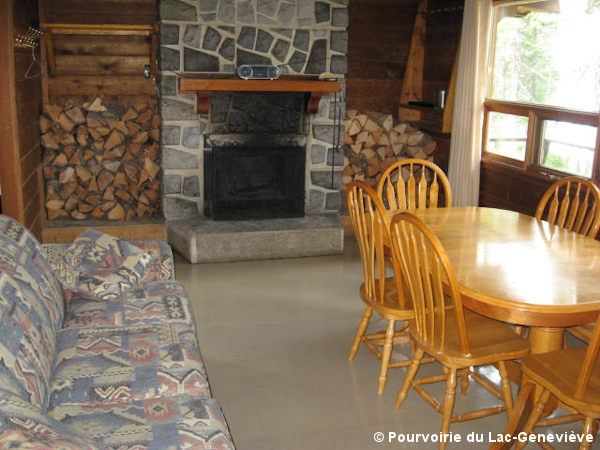 You can also stay at the Lake Valiquette rustic camp, which will give you even more opportunities to commune with nature. Speaking of islands, let’s not forget the Îles de la Madeleine, which have so much to offer! 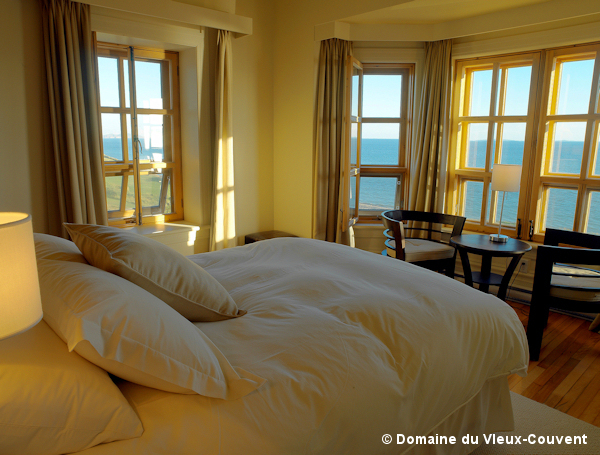 For starters, Domaine du Vieux-Couvent, a former convent, offers traditional island hospitality. With 10 newly renovated rooms and 6 apartments (located in the nearby former presbytery), this establishment, built about 100 years ago, is a great getaway location for visitors in search of peace, quiet and relaxation. The convent’s restaurant, La Moulière, features delicious local cuisine and spectacular views. Welcome to paradise on earth! 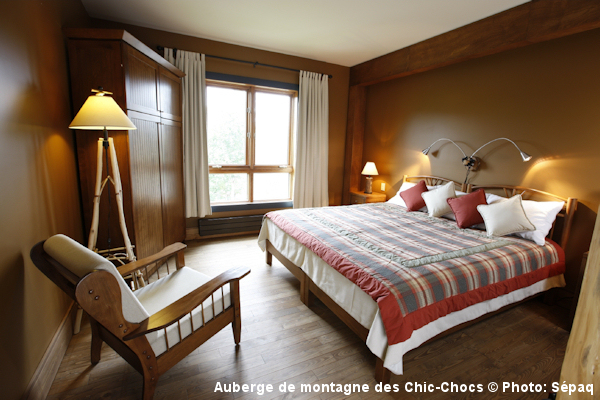 Auberge La Salicorne is located in a similar dream location, surrounded by beaches and green rolling hills. The establishment is as colourful as the village of Grande-Entrée, where it is located. Its authentic and warm furnishings made by a local artisan demonstrate the owners’ commitment to creating a decor that fits with the surrounding environment. This is your opportunity to meet the Madelinots and immerse yourself in their way of life. 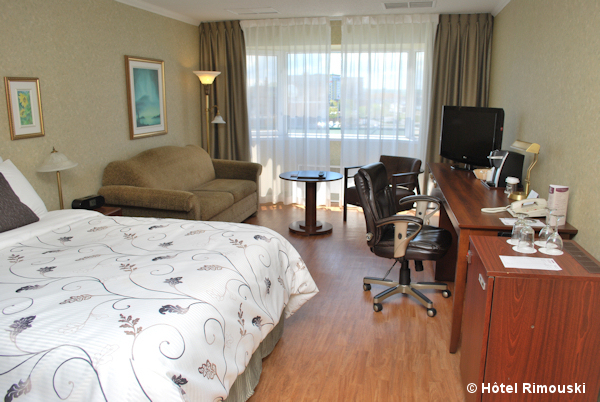 Customized packages allow you to make the most of your stay. The only hard part will be leaving at the end of your vacation! Have I inspired you to want to discover some of these establishments? Why not start planning your next vacation now!